Associate Minister for Arts, Culture and Heritage Grant Robertson announced a call for applications to the fourth round of the Regional Culture and Heritage Fund (RCHF). The round opened on 07 March 2019. Applications closed at 5pm on Thursday 18 April 2019. Decisions will likely be announced in June/July 2019. Subject to the calibre of the funding applications received, around $7 million will be available for possible allocation to applicants to this round. The Regional Culture and Heritage Fund (RCHF) is contestable fund of last resort which contributes typically no more that the last third of the qualifying capital project’s cost. 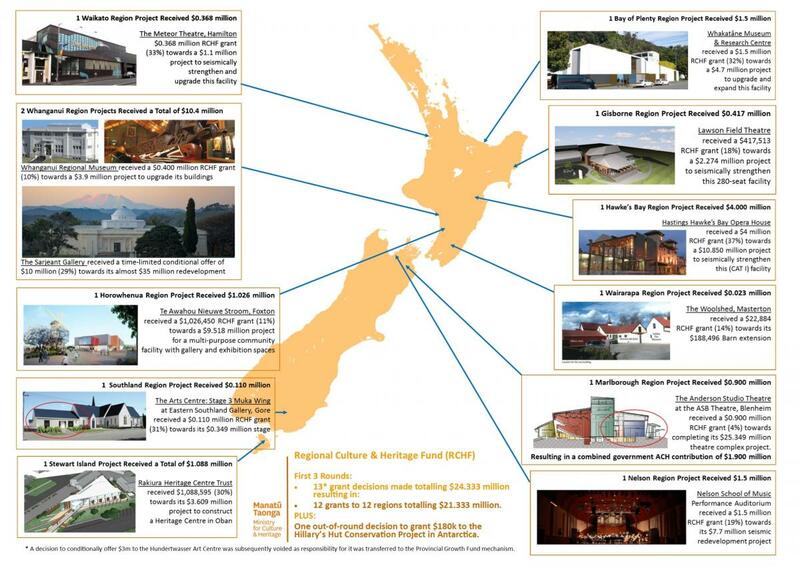 The RCHF accepts applications from institutions for genuine fundraising shortfalls, for qualifying capital projects at public: museums; galleries; iwi museums/whare taonga; heritage buildings or complexes housing significant collections; and performing arts venues. Some entities and activities are excluded under this Fund’s criteria. Therefore we recommend that all potential applicants contact the Ministry to discuss eligibility before committing to the expense of preparing an application. Grant rounds are usually held once per year to enable government to compare and contrast the range of project(s) which have reached their critical mass within their communities but still have genuine fundraising shortfall(s). This fund does have limited resources so projects should not be developed on the assumption that RCHF funding can and will be available. Strong applications will be able to demonstrate that the project has already secured funding from a broad range of other known sources. While open to applicants from throughout New Zealand, the fund’s primary focus is to support capital projects outside the main centres of Christchurch, Wellington and Auckland. Therefore, projects located in Auckland, Wellington, and Christchurch remain eligible to apply and these applications will be considered on a case by case basis. Before submitting an application, all potential applicants should contact the Ministry by phone: (04) 496 6175 or email RCHF@mch.govt.nz and discuss their project. Interested parties who are not yet ready to apply, but would like to know when rounds are being called, can ask to be registered on the RCHF alerts database emailing us at RCHF@mch.govt.nz. Please include a phone number. A map showing the regional spread and key information for previous RCHF funding decisions can be viewed here. Media releases detailing previous funding decisions can be found here. Click here to view a larger version of this funding table. To assist you with finding information on other potential sources of funding, we have made a table of current Government funding sources for capital projects. It’s called Which fund is right for you? This table is a guide and will be subject to change so we recommend that you always go to each fund’s website and then speak with their officials directly for current information. You might also wish to visit our Funding Sources page to learn more about other potential sources of both funding and fundraising assistance. A range of Lottery Grants are available to support community services. Visit Communitymatters.govt.nz to find out more and to apply online. We recommend contacting Lottery Grants Board officials first to confirm best fit and to hear any changed information in relation to your project. Their free phone number is 0800 824 824. Generosity New Zealand provides online search tools which offer access to nearly $4 billion of funds. A relevant product is givUS which lists more than 1,200 grants and schemes for communities, volunteer organisations, schools, groups, sport clubs and Iwi. You can freely access this database at public venues such as public libraries and council offices throughout New Zealand. Click through on each fund’s name to information about MBIE Tourism Infrastructure Fund and the Provincial Growth Fund. Private owners of earthquake prone Heritage NZ listed buildings are encouraged to investigate their eligibility for Heritage EQUIP funding.